Fiona - it's hard to photgraph the black ones! The first thing we noticed about this guy was his unusual coloring and his amazing bundled fleece. He probably got his dusky gray face and tail from his mother. We were thinking he may gray out as he gets older, but at a year, he's looking more fawn than gray. Prince's density seems to be exceptional. 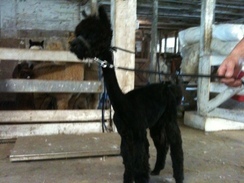 Prince took a first in his first show out in 2011. Prince now lives with the Ayres family. At the start of possibly the "best weekend ever" - while I was away at Rhinebeck at the wool festival, Neal called to say we had a lovely little cria - a girl - what a miracle - 2 in a row. That was unprecedented for us. And what a pretty little girl. 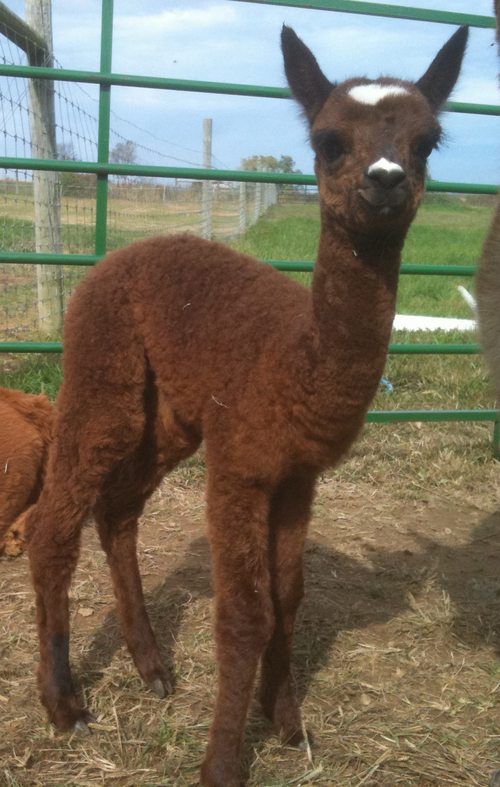 This too was the first cria out of one of our Jr. Herdsires - Felippe. Her coloring fell somewhere between his true black and her mother's dark fawn. She's almost red in color - it's just lovely and her confirmation looks just like her dad's. She's a sweetheart and has done very well with the 4H kids - especially in the Obstacle Course. Gianna is now owned by Sue and Harry Graver. 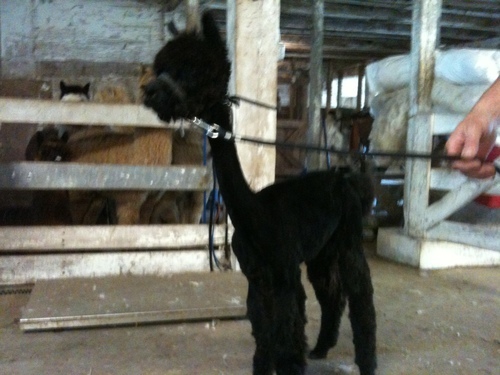 When the picture came through on my phone instead of the lovely brown cria that he told me about, I saw a picture of a black cria. What was this. I then found out that within hours of our little brown girl being born, we had another cria - this lovely black one. Now we were at 3 girls in a row. Update Fall 2014: Fiona has been bred to our own Corado. Both animals have a small frame and expect this to be a great pairing. Fiona looks better now as an expectant mom than she ever has! Update 5/16: Fiona was bred last fall to our beautiful Carderock. Our fingers are crossed for a lovely fine fleeced gray or black baby. What a cutie! It's hard to tell from the picture, but Eden is the light fawn color that has been so elusive for me. What an amazing weekend! 3 beautiful girls born on our farm! 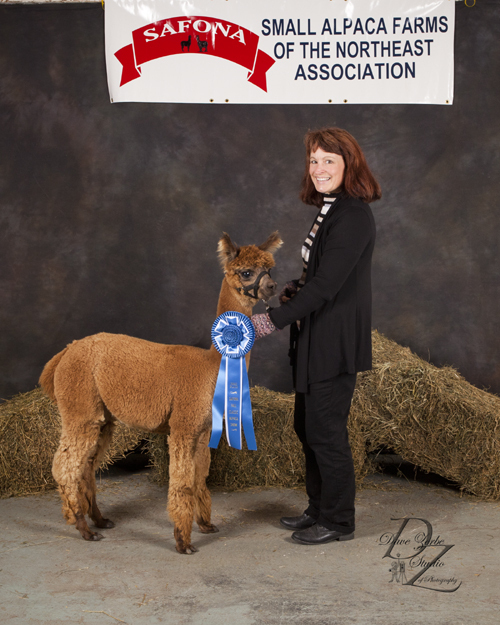 She recently paired with her 4H partner to take the Showmanship Championship at the York Co. 4H Alpaca Show at the York Fair and took a first place at the SAFONA show in Kutztown, PA.
Update 6/14: Eden just delivered her first cria! A dark brown girl out of a silver gray sire! Where the heck did that come from??? Fall 2015: Eden was bred to our lovely Carderock. As you can tell from her previous baby, we have no idea what color this one might be, but we know it will be nice! So when you get a male, it sure is great to get a beautiful silver gray like Toby. Toby is so cute, there isn't anyone who comes to the farm that doesn't fall in love with him. 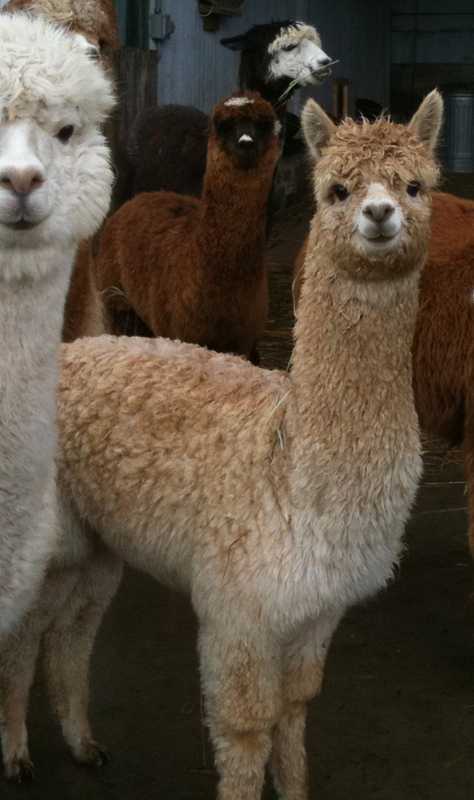 He has amazingly fine fiber and we are hoping that we can put him to work in a year or so for us here at the farm. 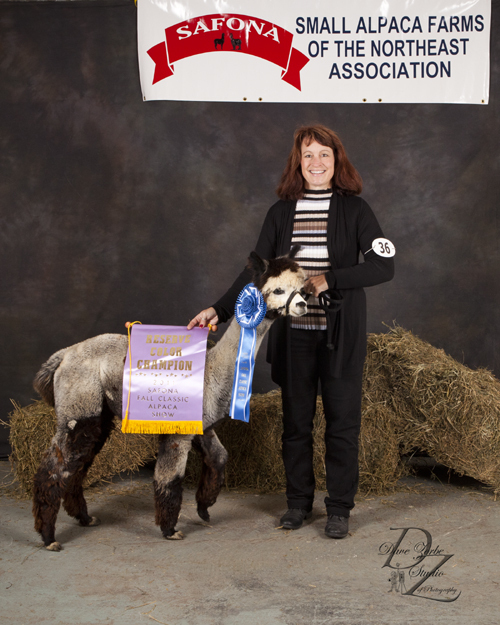 His first time out he took a reserve championship winning out over ALL of the grays, patterns and indefinites! We are very proud of Toby and look forward to breeding him. Update 5/16: Toby has a great personality but unfortunately we can only find one testicle, so he is a pet that produces some awesome fiber. Give me a call if you'd like to add some gray to your herd!